It seems that Bournemouth are a football club that hasn’t been too imaginative with its club badge as we have only been able to find reference to two badges in its entire history. The first one below appeared in the 1959 Encyclopedia of Sport and then again in a late 60’s edition of the Football Review. The badge was apparently adapted from the towns coat of arms and includes the motto “ulchritud et salubritas” meaning “Beauty and Health”. 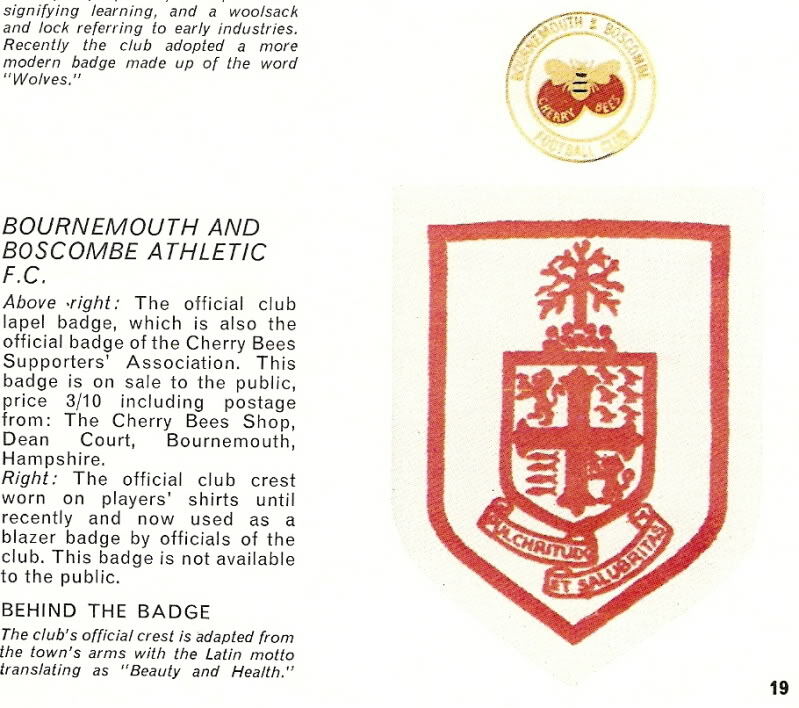 The current badge was introduced in 1971 and the club announced it as a symbol of the clubs progress, it was introduced when they became AFC Bournemouth instead of Boscombe and Bournemouth Athletic. The stripes in the background represent the club shirt at that time and in the foreground is a player heading the ball, apparently the side on image of the player was in honour of Dickie Dowsett, a profilic scorer for the club in the 1950’s. At the time there were various adverts along the lines of “head for the top with AFC Bournemouth” and since then Bournemouth seem to have been been content with their badges and have resisted the way of most clubs nowadays and left it as it is.